"Customer relationship management (CRM) is all about managing the relationships you have with your customers-including potential customers. CRM combines business processes, people, and technology to achieve this single goal: getting and keeping satisfied customers. It's an overall strategy to help you learn more about your customers and their behavior so you can develop stronger, lasting relationships that will benefit both you and your customers. It's very hard to run a successful business without a strong focus on CRM. After all, it's all about the customer." "Successful CRM involves many different areas of your company, starting with sales, of course. But also various other customer-facing areas, like marketing and customer service. Salesforce.com offers a technology solution for all those areas… and more. With Salesforce CRM software as a service and our Force.com cloud computing platform, you can mind your customers and your budget at the same time (very important in today's economy). Get up and running in 30 days with the world's most proven and loved CRM solution." SalesForce.com does this and only this, so it does it much better than AXIOM could ever do. So we have a problem. We store some information in AXIOM, and some other information (more details) in SalesForce.com. SMART has a suite of programs that integrate the data in AXIOM and SalesForce.com into one data set, so the need for double entry of data is eliminated, and a manager can go to one place (the CART.exe reporting tool) for all data. With the use of the Windows Scheduled Tasks utility, SMART logs on to the Salesforce.com web site nightly and downloads the latest data. SMART then integrates this data with AXIOM data to provide reports with data from both sources. It is important to note that this SalesForce.com interface program does not need any other SMART tools to function. 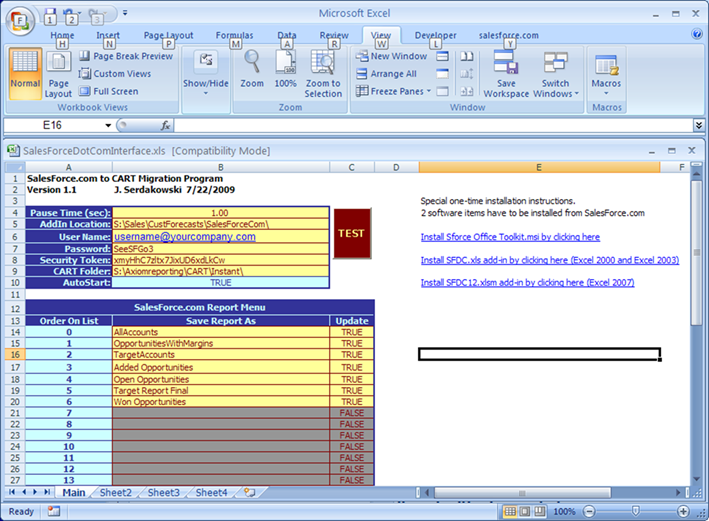 You only need a SalesForce.com account and Excel to have this program work for you.